These dogs have a lot of personality packed into little bodies. Learn more about this energetic breed and its history. 1. YORKSHIRE TERRIERS STARTED AS RATTERS. These little dogs were bred from a collection of terriers, including the Waterside terrier, in order to hunt rats. Miners, weavers, and other business owners in Scotland used the tiny exterminators to keep their workspaces rodent-free. Because of their compact size, Yorkshires could squeeze into tiny spaces; their fierce personalities helped them fearlessly take on their rodent prey. Like other terriers, the dogs were also used during hunts to flush prey out of its den. 2. WEAVERS BROUGHT THEM TO ENGLAND. When weavers came to England for work in the mid-1800s, they brought their tiny dogs with them. Before long, the breed caught on, and started appearing in shows in 1861. 3. THEY HAD A NAME CHANGE. When the breed first hit the scene in England, they were known as broken-haired Scotch terriers. They kept this moniker for nearly a decade before a reporter named Angus Sutherland opined that the name should be changed. He believed that although the breed originated in Scotland, it wasn’t perfected until coming to Yorkshire, England. "They ought no longer be called Scotch Terriers, but Yorkshire Terriers for having been so improved there," Sutherland reported in The Field magazine. People seemed to agree, because in 1870, the name was officially changed. 4. ONE DOG WAS PARTICULARLY IMPORTANT TO THE BREED'S SUCCESS. Most consider a Yorkie named Huddersfield Ben the father of the breed. The stud dog was a ratting champion and a confident competitor in dog shows; he won over 70 awards. He was a hefty dog, weighing 11 pounds, but all his litters yielded puppies that were under 5 pounds, which was the standard at that time. Even though he only lived to be six years old, he left behind an impressive legacy: Most Yorkies bred for shows today are distant relatives of Ben. 5. THE FIRST THERAPY DOG WAS A YORKIE. When American soldier Bill Wynne found a Yorkshire terrier in a foxhole during WWII, he named her Smoky and took her in. The two traveled through New Guinea, and Smoky soon began to help with the war effort. Thanks to her small size and obedience, she was able to run through pipes and string communication wires under a former Japanese airstrip. Without her help, soldiers would have had to dig trenches and expose themselves to enemy fire. Smoky also toured hospitals throughout the Pacific and the United States, working as a therapy dog for wounded soldiers. After wartime, she and Wynne went to Hollywood, where she performed on various TV shows. You can visit a monument dedicated to her memory where she passed away in Cleveland, Ohio. 6. THEY GIVE RAPUNZEL A RUN FOR HER MONEY. Yorkies do not shed, so that means they depend on their owners to keep their hair in check. Left unattended, their hair will keep growing, just like a human’s would—in fact, Yorkshire terrier hair can grow to be two feet long. While show dogs tend to have longer hair, most casual owners keep their dog’s hair short to keep them from tripping or getting food stuck in it. This shaggy look is often called "the puppy cut." 7. ONE YORKIE WAS USED TO START A NEW BREED ENTIRELY. In 1984, a little Yorkie named Schneeflocken von Friedheck was born with unusual markings in blue, white, and gold. The breeders Werner and Gertrud Biewer decided to take this unique puppy and create a new breed. With careful and selective breeding, they established a distinct standard for the breed which would become known as the Biewer terrier. In 2014, the American Kennel Club provisionally accepted the new Yorkie as a registered breed. 8. THEY MAKE FUNNY NOISES. Yorkshire terriers are especially prone to pharyngeal gag reflex, or reverse sneezing. Instead of pushing air out of the nose like a normal sneeze, dogs will gasp for air, making a honking sound like a goose. While somewhat alarming to witness, these noises are ultimately harmless and pass after a few minutes. Usually, they're brought on by irritants like pollen, dust, cleaners, and perfumes. 9. YORKIES WERE ONE OF THE FIRST REGISTERED BREEDS. Although not a particularly old breed, these tiny dogs were one of the AKC'S original breeds. 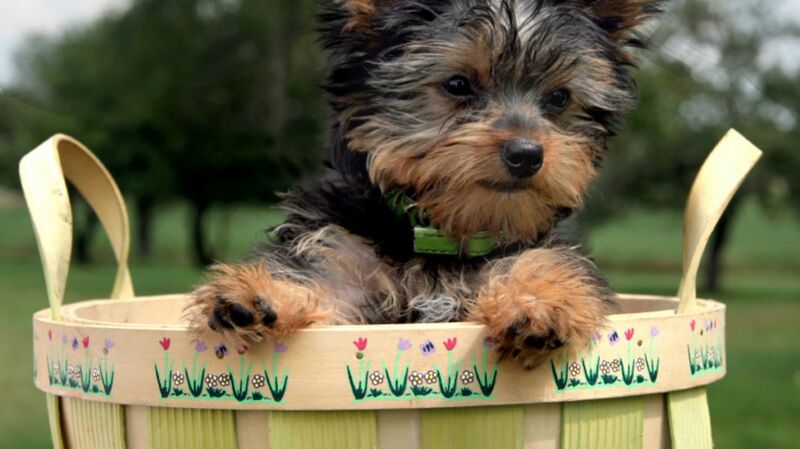 Yorkshire terriers became registered in 1885 along with classics such as the beagle, basset hound, and bull terrier. 10. YOU CAN COUNT ON THEM TO HAVE YOUR BACK. Yorkies are small dogs, weighing an average of seven pounds, but it seems like no one told them that. The dogs have no problem taking on animals considerably bigger than them. In August 2015, Larry Yepez stepped out of his home early in the morning while it was still dark out. A bear had been rummaging through his trash and attacked the man. Yepez put up a good fight, but struggled to get away from the agitated 200-pound mammal. Luckily, his Yorkie was there to nip at the heels of the attacker and distract it long enough for the duo to make a quick escape. Thanks to his pet's intervention, the bloodied victim was able to drive himself to the hospital—and live to tell the tale.